You were all set to drop a few hundred dollars on an Eero mesh network. But then the company was purchased by Amazon, which you already know controls a big chunk of the internet, so maybe you’d rather it didn’t control your little private part of it, too. If you’re feeling stuck because you really need a new router, don’t panic. There are options available if you’d rather avoid Eero (as well as Amazon, Google, and Apple)—good options! There are also ways to check your entire network to figure out if you even need a new router to begin with. But first—router options. We’ve discussed previously how there are two kinds of routers to be aware of. Mesh routers, which are multiple routers communicating with one another to cover a large space and get around possible wifi killers like mirrors, piping, and thick brick walls; and point-to-point routers, which are usually a single router set in a central point in the home. Point-to-point routers can be extremely powerful and have lots of tricks to get around dead spots, but they’re usually best for small homes and apartments. Routers used in a mesh network are smaller and less powerful, but you buy multiple ones and dot them throughout the home. They’re better for multistory homes or really large and sprawling ones. 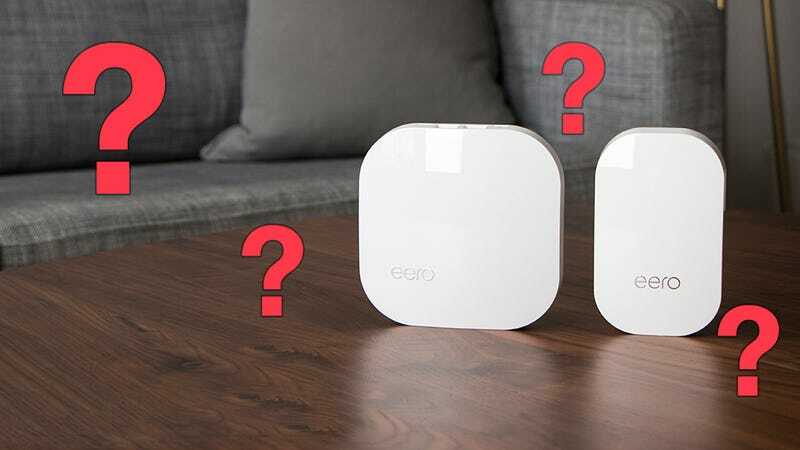 Traditionally we’ve highly recommended Eero because it’s damn easy to set up, it’s good enough for all but the biggest bandwidth hogs, and it’s attractive. But the Netgear Orbi starts at under $300, comes in a wide arrangement of configurations, and can be just as fast as Eero. It is a lot larger though, and if the multiple calls I’ve had with my mom over the course of a week is anything to go by, it’s more difficult to set up than Eero, too. Ubiquiti’s Amplifi mesh network is another good option that starts at $150, as is Linksys’s Velop system, which starts at $300. If you happen to be using an Asus router or two, you can create your own network from old and new Asus routers using AIMesh. But before you go expanding your current network, or buying a whole new setup, double and triple check that the problems with your current system are router-based. The router and the modem are two different things—though they can sometimes be the same device (it’s confusing, I know). Your router routes traffic on your network. It handles how all the devices in your home talk with each other. Your modem communicates with the outside world. Sometimes these two devices are the same thing. Many Internet Service Providers (ISPs) bundle the modem and router together or provide you with a modem with a router built in (they’ll often call it something like a modem with Wi-Fi). But if you have two boxes, then chances are you have a modem and a router. The modem will usually connect to the outside internet via a coaxial cable. It will then connect to your router, or internal network, via Ethernet cable (that’s the one that looks like a fat phone line). To test if your modem is the problem, you’ll want to navigate to its settings on your network. Usually, this is address http://192.168.100.1, but you’ll want to check with the user manual for your specific modem. I use an Arris modem, which is a very popular brand of modem that works with a wide variety of cable internet providers, including Spectrum. Other modems will look different, but many of the principles and tips discussed will still apply. When I log into my modem I see this quick look at connectivity for it. A glance at the Status column tells me my internet is up and running, but this column looks different when the network for your area is down, or iyour modem is having difficultly making a connection. If the Status column ever says anything besides the above then you can assume there is an issue somewhere between the coaxial cable going into your modem and the ISP’s infrastructure. Go ahead and contact your ISP, which will either inform you of an outage or send out a tech to hunt down the problem on the ISP’s end. If the Status column shows that the connectivity is fine, scroll down on that same page. You’ll now see a box called Downsteam Bonded Channels. If it isn’t on the home page for your modem then hunt around. It may be located in another tab. The number of channels available depend on your ISP, modem, and connection, and most of us don’t need to pay attention to that. What’s crucial here are the Power and the SNR columns. Power represent the strength of the signal and the number should fall between -15 dBmV and 15 dBmV. If the Power is outside that range try a different coaxial cable and restart your modem. If that doesn’t fix the problem, contact your ISP. SNR stands for Signal to Noise Ratio. The SNR should be above 33 dB. Again, if the SNR is lower than that, double check your coaxial cable and replace it if possible. If that doesn’t fix the issue (after a restart, of course), then there may be significant noise somewhere else on the line. It could be a tree touching a cable, or a wire that wasn’t buried correctly outside the house. Whatever the issue it likely falls under the purview of your ISP, so give them a call and have them send a technician out. The final set of numbers to double check are the Upstream Bonded Channels. This table can usually be found on the same page as your Downstream Bonded Channels. Again, the number to worry about here is the Power. It’s usually the last column. A good power level per channel is between 38 dBmV and 48 dBmV. If it is much lower or higher, you’ll want to check the coaxial cable and/or contact your ISP. If your modem is functioning perfectly with great SNR and Power levelsthe problem could be the Ethernet cable that connects your modem to your router (provided your modem and router are separate). Power down both. Replace that Ethernet cable, and power both the modem and router back on. If everything starts working smoothly, with consistent speeds, then congratulations. You’ve fixed your entire network for under $10. Unfortunately, if you’re positive everything is perfect from you ISP down through your modem, the culprit is probably your router. If you have a computer with an Ethernet cable connect it directly to your modem and test your speeds using a resource like speedtest.net, which gives you a decent idea of your average speed, or fast.com, which tests your speed connecting to Netflix’s servers. If everything works perfectly its likely your router that’s the issue. But you don’t need to replace it right away. Sometimes fixing the router is as simple as adjusting the channel it broadcasts on. Wifi, like all wireless signals (including your TV) operates on separate channels and the more crowded a channel gets the worse the internet. Most newer routers will find the least crowded channel, but sometimes the automatic channel assignment fails. It’s pretty simple to figure out if this is the issue—at least if you have an Android device handy. Download WiFi Analyzer, which can show you all the different wifi signals cluttering things up around you. If your router’s wifi is in a cluttered channel, identify a less cluttered one. Then change the channel on your router. Each router does this differently so refer to your router’s manual, or search “wifi channel change” and the name of your specific router. For Windows users, we recommend Wifi Analyzer, which our colleagues at Lifehacker have written a handy guide for. If a badly chosen channel isn’t the culprit, other factors in your home might be interrupting the signal as it travels from the router to your device. Don’t worry, we’ve already done an extensive guide on troubleshooting that issue. And if it is that issue, or if none of the solutions above have helped, then it may be time to invest in a new router. Fortunately, you can do that without involving Amazon, Google, or Apple.